With ZENSPIRE Relax, no need for a smartphone or computer. It does not use Wifi or Bluetooth. Its simple half-sphere design measures only 8.5 cms in diameter and is pleasant to the touch. It guides your breathing to the rhythm of a blue light and/or vibration. You can place it on your desk, next to your bed, or in your pocket. Much more effective than the breathing guides used with hyperactive children, it allows older people who may not be familiar with smartphones to practice breathing. Regardless of your age or health status, whether you are energetic or lethargic, experienced or inexperienced, the heart coherence technique works in 100% of cases. Breathing seems to be something natural and insignificant. Heart coherence is the easiest and most effective of all methods. But to be truly effective, we need to know different breathing methods and their associated benefits. To benefit from heart coherence, you just have to breathe. But not in any way: an inhalation of 5 seconds followed by an exhalation of 5 seconds. The frequency is 6 full breaths per minute. The heart rate then synchronizes with the respiratory rhythm, and the brain interprets this state as emotionally neutral. As a result, the body starts to function better. It does not tire as quickly. Its resistance to diseases and intellectual performance (memorization, decision-making, and creativity) are also reinforced. All of this can be physiologically explained. A few minutes of heart coherence lead to changes in the immune and hormonal levels. Decreased cortisol levels (responsible for the negative effects of stress), increased DHEA (anti-stress hormone), and increased immunoglobulin A (IgA, a stress marker that persists in the blood 6 hours after exercise). According to clinical studies conducted over the last 10 years by the American Institute HeartMath, regular practice of heart coherence reduces blood pressure in hypertensive patients, blood cholesterol levels, and pain perception, especially in cases of osteoarthritis or acute arthritis. How to use your ZENSPIRE Relax ? ZENSPIRE Relax is very easy to use. Press the ON/OFF button to begin a 5-minute session. Blue light with vibrations: I inhale through my nose for 5 seconds while concentrating on my abdomen.White light without vibrations: I exhale through my mouth for 5 seconds while concentrating on my abdomen. To adjust the intensity, hold down the buttons. 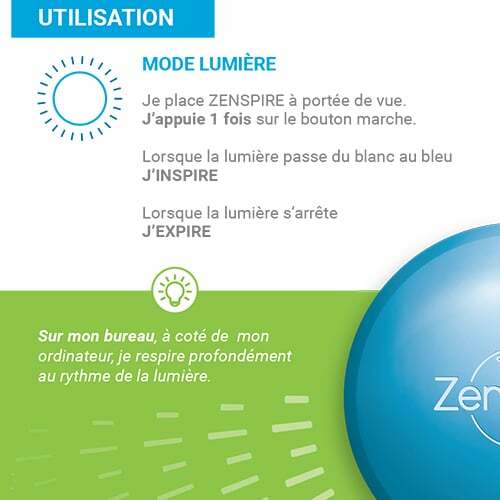 Every time you adjust the light or vibration function, you restart a 5-minute session – ZENSPIRE memorizes the last settings used. Wherever you are and whatever you’re doing, ZENSPIRE adapts to your needs. By synchronizing your breath with the light variations of ZENSPIRE or placing your hand on top of it to feel to the gentle vibrations, you will always return to a state of calm. next to my computer and I breathe calmly to the rhythm of the light. and I breathe calmly to the rhythm of the vibration.